A PMO serves two critical functions in an organization. First, it is the eyes and ears of management to identify problems and risks. Second, the team is in the uniquely positioned to help resolve these issues. Through interacting with project managers, reviewing projects, and analyzing metrics, the PMO is able to pinpoint the challenges and opportunities presented to the company. This presentation examines what makes a PMO effective in living out its purpose and gets your engine revved with ideas on what can be accomplished. For the individual already leading a PMO, it will allow you to spot check what you have and tune your organization with best practices that will increase your performance. The intent of this session is to present best practices used by high performing PMOs to raise the performance of their organizations. Cornelius Fichtner: Hello and welcome to this PDU Podcast sample. My name is Cornelius Fichtner. I am the host of the program. In the next 10 minutes or so, you are going to see a shortened version of an actual webinar taken from The PDU Podcast series. The idea is to give you an idea of what our webinars are like and allow you to try them on your portable media player. That’s why we give you both a high resolution and a low-resolution version of each of our free podcast samples here. Copy them to your player and try them out. 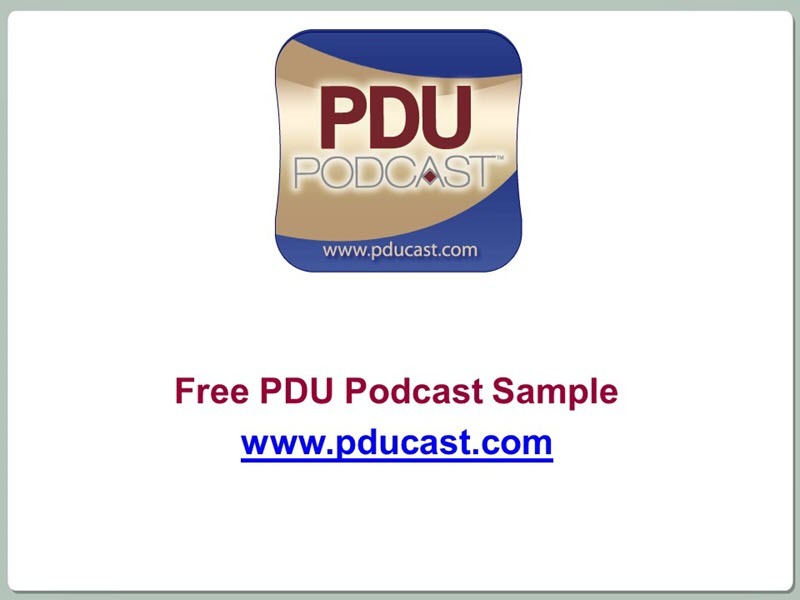 To find out more and order your full subscription to the PDU Podcast, please go to www.pducast.com. That’s p-d-u-c-a-s-t .com. And now here’s your sample webinar. Cornelius Fichtner: Welcome back to this PDU Podcast presentation, High Performance PMOs, what makes a PMO effective with me, Cornelius Fichtner and your presenter, Thomas Cutting. Cornelius Fichtner: In Part 1 and 2 of this presentation, you saw contemplation commitment, conversion and communication. And now, Tom will close it out by looking at compliance, community and conversely speaking. Thomas Cutting: Moving on to compliance: In order to be compliant, first people have to know what’s expected of them. So we want to establish expectations and set tailoring guidelines. If people don’t know what’s expected of them whether that’s through policies and procedures then you’re setting them up for failure. Thomas Cutting: So the first part of that is documenting it. You want to make sure that you document what it is you’re supposed to be doing and then train them, but don’t just train them how to do it. Train them on why they are doing it. Nothing kills a PMO faster than having the project managers go to the business and say: “Hey, I need you to sign this change request because the PMO is making me do it.” If they can’t articulate why they are doing something then it’s just going to become overhead and the business is going to turn on the PMO and say: “Why are you making them do this? I said it was okay. Why did they have to have a form for it?” So make sure not only training them what to do but also why they are doing it. Thomas Cutting: Then they also need to know that they can tailor their processes and procedures to fit their project specifics. Not all projects are created equal. There are circumstances where you might not have to do something as rigorously for a smaller project. So set those guidelines upfront. Set it up so maybe it’s small, medium and large projects but make sure that they know that the rigor involved with a small project isn’t as much as a large project. Thomas Cutting: And then on top of that, you need to provide them with the capability of justifiably deviating from the standards and getting approval for it. So that everybody’s on the same page. It’s okay to break the rules as long as everybody’s on the same page with that, right? Thomas Cutting: The next thing is tracking results. Normally, PMOs track projects to ensure that they meet their commitments to budget and schedule. That’s kind of what a normal PMO does. And then a year from now perhaps, the PMO circles back around in the business and says: “Hey a year ago, we put this project in for you. Did we meet your ROI objectives? Did we meet your productivity savings? Did we meet your marketing goals? What other business objectives did we set back then? Did the project meet that?” And although that doesn’t tie directly into that project perhaps, that information can feedback into the PMO to make it better and make it more focused on obtaining the business objectives and goals. Thomas Cutting: Now the next step is going to be verifying compliance. You can’t assume that compliance exists. It’s going to be verified. If you don’t verify compliance, you’re kind of hoping that things are done right. Cornelius Fichtner: And sort of inspect or the expect, right? Thomas Cutting: Exactly. And on top of that, if you have a strict standard that people are supposed to abide by and you’re not checking the compliance of it, it really just becomes a suggestion, right, and they can do it or not. You never know. Thomas Cutting: Now the first part of compliance is going to within peer reviews so both at the project management deliverables and even the development deliverables. You want to start performing period used to ensure that they are complete that whatever it is you deliver fulfills the intended purpose of it and that it meets certain quality expectations. That’s going to happen on two levels. The first one is just because you know somebody’s going to look at it, you’re going to do a better job at it. And then secondly, a peer review is going to come back and find things that you’ve might missed yourself. So it’s kind of a double advantage doing a peer review. Now the next one are SOX and CMMI audits, those types of things. The SOX being the Sarbanes-Oxley that was put in place for financial institutions to make sure that they were meeting their obligations. CMMI is the Capability Maturity Model Infrastructure so that the organization is continuously improving and maturing in the way that they do things. So if you promote adherence to those, you can ensure that the processes developed aligned with both of those things. We had a situation where the question came up. Our projects were passing our audits but they were failing the corporate Sarbane-Oxley audits. The question came: Why aren’t they in alignment? And we had to go back to make sure that our audits checked for many of the same things that the Sarbane-Oxley audits to check for. So that when we did an audit, we’re in alignment with what they are doing. The same thing goes with your process and procedures. If you alight your processes and procedures with the Sarbane-Oxley, with CMMI, then you are setting yourself up for success in both of those areas too, right? Thomas Cutting: So we talked a little bit earlier about deliverable peer reviews, also project peer reviews. If you’re doing a peer review of your fellow project managers’ artifacts, it’s going to be a lot less confrontational than an audit review. Cornelius Fichtner: So we hope at least? Thomas Cutting: Yes. And it also gives you a chance to learn from each other so you come through and you say: “Oh, I took a look at your status report or your charter or whatever. And you know I’ve always done it this way. I like the way you do this section. But I think maybe you need to take in and incorporate what I do in my section here” and then you’re both learning, right? So it gives a great opportunity for growth in ensuring that people learn from each other. Thomas Cutting: And then the finally the project audits. The project audits provide a measurable means to show whether or not the organization is becoming consistent in the way they approach project management. They help to identify recurring areas of weakness so that you can go back and fix those areas. It also shows areas of improvement so that you can again market that back to the organization and say: “Hey, we are being better at this. You will notice that our projects are coming on schedule now.” That’s the type of marketing you can do as you prefer. Thomas Cutting: Successful PMOs are able to enforce are able to enforce their standards rather than being a think tank where lessons learned and good ideas are allowed to ferment. A PMO is intended to standardize the way work is done. As mentioned the previous slide, expectations need to be set. You need to understand what those standards are. It needs to be clear which items are standards and which are just recommendations. If you’re not enforcing them then verification is not happening. If the verification doesn’t happen then you might as well not have the standard in the first place. So if something is labeled as standard but people aren’t being held responsible for it then you might as well regulate it back to a best practice. Now if you have the verification but you don’t have the accountability for it unless it’s going to breed contempt. You’re going to come out and say: “Hey you’re doing things wrong.” And people are going to say: “So, who are you to tell me that and why do I care?” So verification without accountability but then accountability without consequences invites chaos. So if the organization doesn’t do anything about those project managers who are not following the standards then your PMO has no value. That comes with the upper management support, right? People are going to start picking and choosing whatever standard they want and the benefits sought from a consistent project manager is not going to materialize. Cornelius Fichtner: How do we ensure that project audits and this is really what compliance in many companies boils down to, is not seen as something negative but that everyone understands that we audit our projects for the overall benefit of the organization? I asked you this because I used to work in a bank and I can tell you that the audits that were dumped to us, it was just pure compliance audits. People never cared about success or failure of the project. All that the audit has cared about is: Did you fill in form A? Correct. Thomas Cutting: A lot of that comes from the delivery of the audit, right? If you’re showing a value in the audit to the people who are being audited then it’s going to be accepted. Part of that delivery if it’s done as a mentoring opportunity, we come back with the audit results and say: “Hey, I noticed you didn’t do your risk management plan for the last three months. You understand by identifying your risks and resolving those risks, you are actually stopping some of these issues that you’re seeing now from happening. If three months, you would have said: Hey I’m going to have a resource problem. If you recognized that, we could have brought resources in to do that.” So it’s that mentoring attitude to say: “Here’s why we do what we asked you to do and here’s the consequences to your project, not you as an individual but to your project and to the organization if you fail to do that.” That’s the first part. The other way of making it meaningful to them is to take their feedback so you can adjust the process. They come back and say: “You know what? I would like to do risk management. However, the form doesn’t make sense to me. Can’t we bring this is in?” or “Have we thought about adding this to the process or removing this because that’s just busy work. You’re making me count all these things. Nobody does anything with that. Take that feedback of the process. If you’re right, I’m going to make sure that process gets changed so that it works more effectively.” There is where you get your buy-in for everybody. Cornelius Fichtner: Right, you’re taking compliance as a step further here. Not just enforcing standards, we also want to talk about holding the PMO accountable in regards to compliance. What are we talking about here? Thomas Cutting: Sure! If you’re holding them accountable to the policies, the standards and processes, from two perspectives. One is they’ve got to do them. But then also, they have to be a part of that process of making those policies, making those standards, making those processes work for them. That’s that feedback part two. Thomas Cutting: The next part is adherence to the process. You need to hold them accountable to adhering to the process. It’s going to be easier if they’ve had a say in what that process is. But still, adhering to that is going to be key. And then showing them that they are accountable for the project success. So the PMO helps establishes policies. The PMs help build those policies and processes. The PMO, they need to make sure these processes happen. But then the PMO has to also be responsible for the project success. A lot of PMOs come up and say: “Hey all I do is process. It’s not my responsibility.” If project failed, it’s a project manager’s fault. It’s management’s, somebody else’s fault. But if you hold the PMO accountable for that project being successful then they have more of a stake in the game, right? And if you hold them responsible for the organization’s success, that raises the awareness up to a higher level. Management is involved in deciding that the PMO makes or breaks our organization.